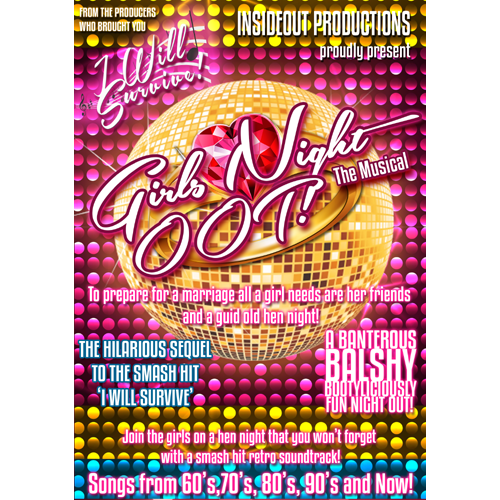 Girls Night OOT is the hilarious sequel to the musical comedy 'I Will Survive' which has been touring for the last 2 years and playing to sold out crowds. The show is being produced by well known Scottish company Insideout Productions, and artistic director Paul Harper-Swan commented he was "thrilled to be bringing this new show to Scottish audiences. The cast are amazing, the story is fun and the music will have you dancing in the aisles". and now there's a wedding on the cards. To survive this marriage, all a girl needs are her pals and a guid old hen night. The show features feel good songs such as “I'm Every Woman,” “Girls Just Wanna Have Fun” and “Proud Mary” and stars three of the original I Will Survive cast: Donna Hazelton, Lauren Ellis-Steele and Alison Rona Cleland. They will be joined on this adventure by Natalie Tulloch, who appeared in the most recent tour of 'The Steamie'. Girls Night Oot will run at the Websters Theatre from 14th -16th of April.